On March 20 in State College, PA, 29-year old Osaze Osagie’s father called the police requesting they check on his son, worried that he was experiencing a mental health emergency. When 3 police officers showed up to Osaze’s apartment to serve a “mental health warrant” they killed him, firing multiple gunshots. The State College police department is refusing to be transparent in their investigation into what the coroner has classified as a clear homicide. Osaze was killed last month and we still don’t know the officers’ names, nor have we seen any video or audio recordings. Osaze is dead and the three police officers involved are free to collect their paychecks while remaining anonymous and protected by their department. Color of Change is calling on State College Mayor Donald Hahn to immediately fire all officers involved in Osagie’s death, lead an independent investigation into the events that led to the tragic killing, and implement the use of trained unarmed mental health professionals as first responders to mental health emergencies. Mayor Donald Hahn has the power to hold the police department accountable and implement long-term changes so that no other Black people who are in need of desperate help are murdered. It is vital that we call on State College Mayor Donald Hahn to act now. 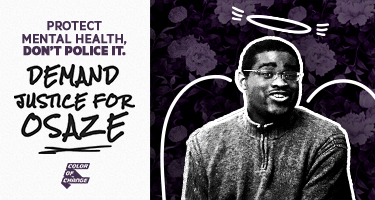 We ask that you take immediate action towards justice for Osaze Osagie by holding the State College police department and its police officers accountable for the tragic killing of Osaze. On March 20th, his father dialed 911 to get his son the care he needed. That act should not have resulted in 3 police officers murdering his son. Perform an independent investigation into the shooting, including police protocol and all audio and visual recordings of the shooting. Implement a city-wide mental health policy, which includes employing trained mental health professionals as first responders for people experiencing a mental health crisis. People are depending on you to take swift and immediate action so that what happened to Osaze doesn't happen again.